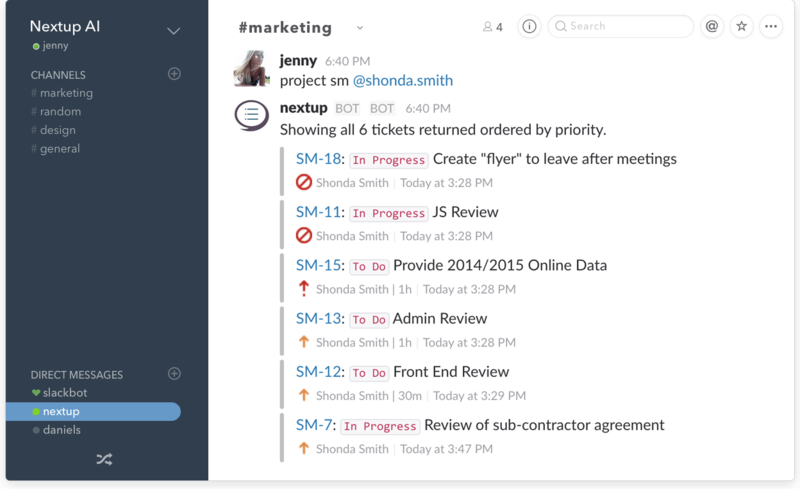 One of the best ways to use this bot is to find out what is happening in Jira right from Slack. 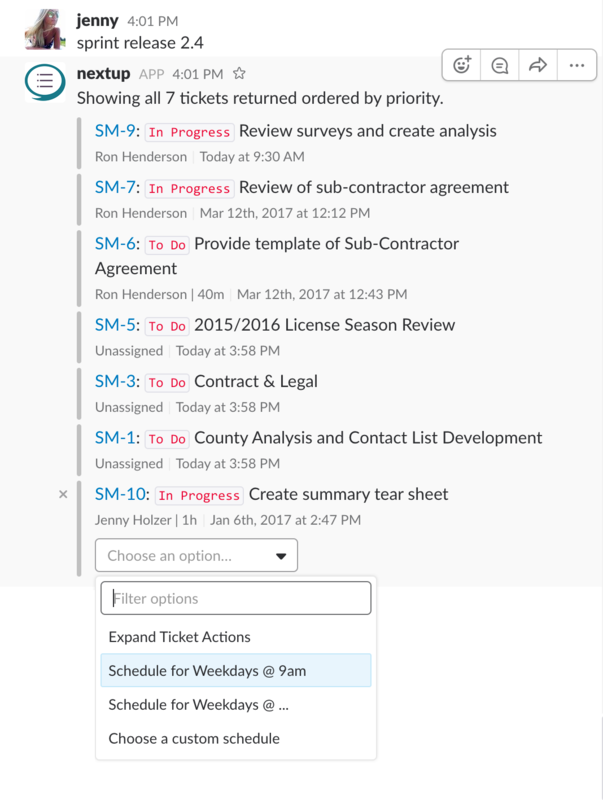 Teams use this feature to get current information or combine with our scheduling feature to get scheduled updates. 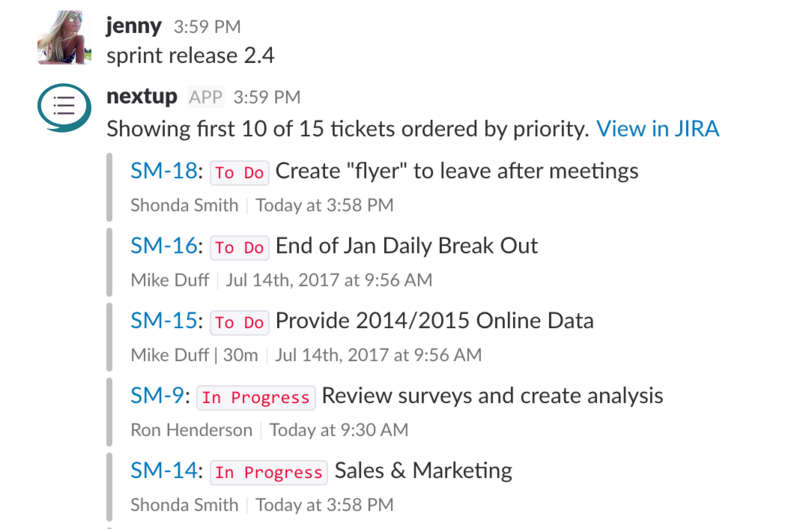 The JIRA bot from Nextup allows you get summaries of your projects in JIRA directly in Slack. Use these formats to get the information you need quickly and easily. 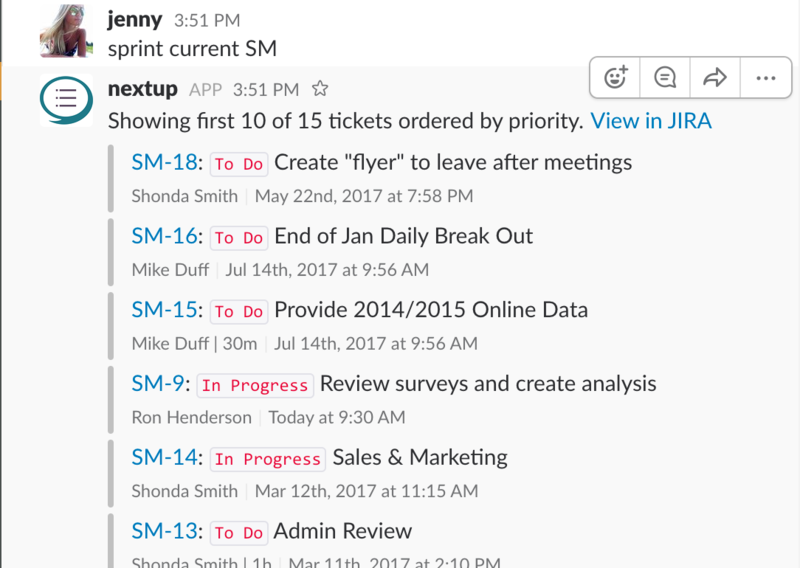 Looking for a summary of your JIRA project within Slack? Nextup has you covered. This command gives you 10 tickets ordered by priority to help you keep tabs on what is going on. In the example below the text project sm alerts the bot to get a summary of the Sales & Marketing project with the project code SM in JIRA. Use this format to get a summary of what a specific user needs to get completed in your JIRA project. This is used to check on specific priorities from project managers, scrum masters, etc. Users also use this to check what they need to do for the projects they are working on. In the example below the text project SM @shonda.smith alerts the bot to get a summary of the Sales & Marketing project with the project code SM in JIRA assigned to the user Shonda Smith. Some teams work more focused on sprints and the bot supports that way of thinking as well. 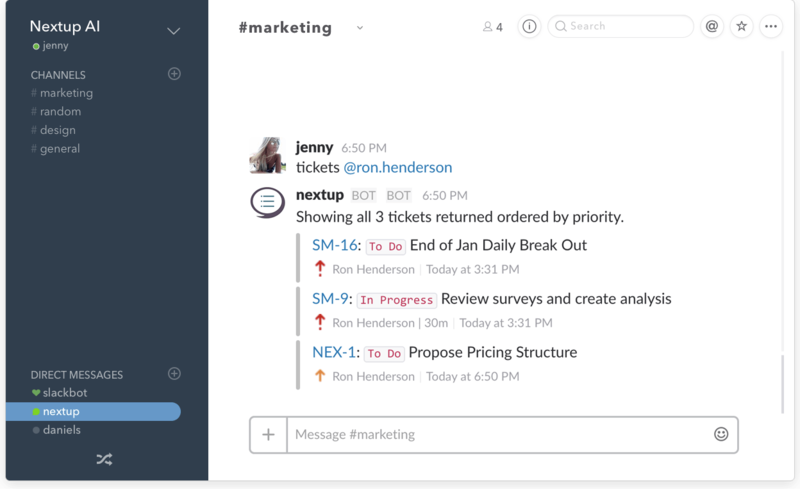 The Nextup bot provides a number of way to look at issues for yourself or for a specific user. Review the examples below to see how you can get the most out of your work in JIRA by looking up information with Nextup JIRA. Use the format below to get a summary for yourself of a specific user by using the Slack @ dialog to choose a user. This will get the top ten issues assigned to the user spanning all projects. 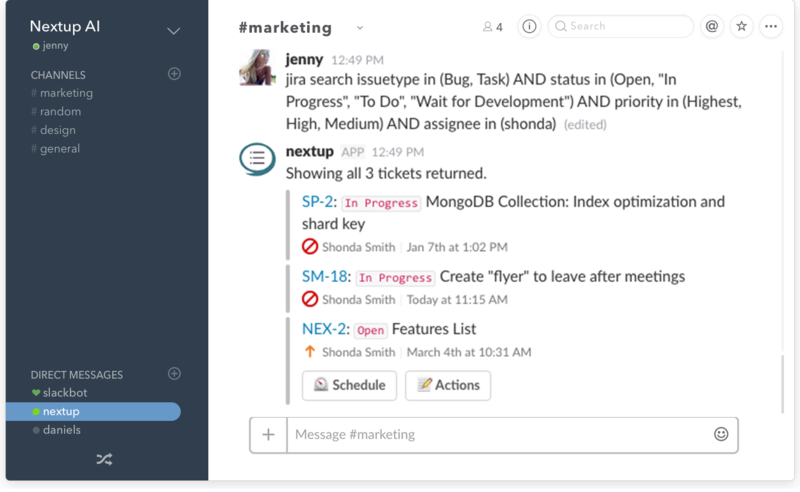 JIRA provides the ability to perform advanced searches for your issues and Nextup allows you to run these advanced searches within Slack. 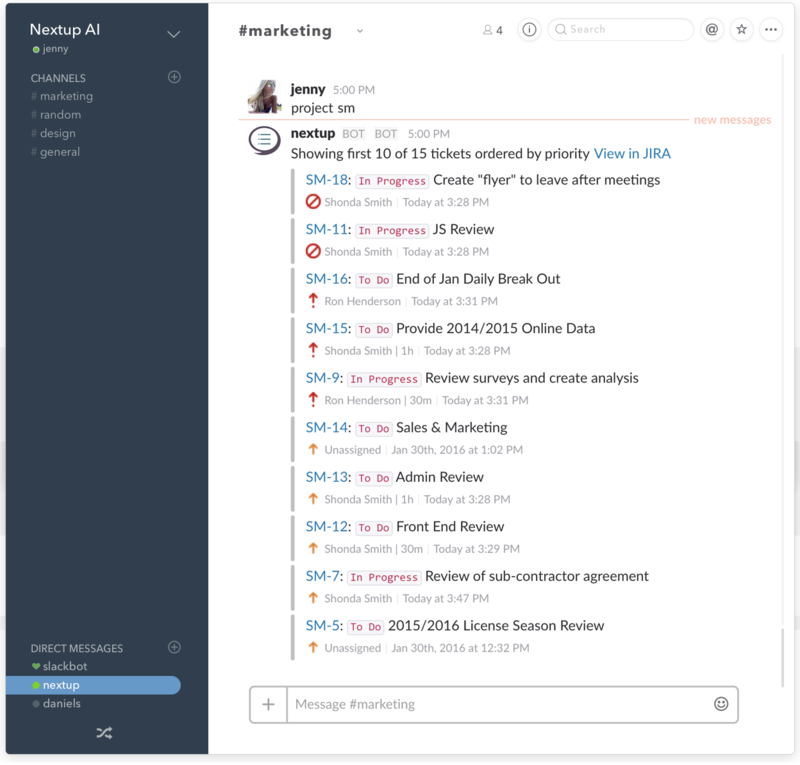 You can write JQL formatted messages directly in Slack or create them in JIRA and copy the syntax into Slack to retrieve your messages and create scheduled responses. The JIRA query language (JQL) allows for complex searches for issues. This is how you can create queries in JIRA and then utilize them with Nextup. Use our scheduling functionality to get a specific set of issues based on a set schedule - just use the dropdown.